We believe in true love. We believe in champagne toasts, stolen kisses and epic dance floor moves. We believe in capturing your unique, authentic love story for generations to come. And we believe in providing you with an unparalleled level of service and quality heirlooms to preserve your memories forever. Laura is a photography goddess / visionary / miracle worker, and she made our entire wedding experience SO MUCH BETTER than it would have been with anyone else. You don’t want just any old photos of your wedding day. You want AMAZING photos, full of beaming smiles, happy tears, epic dance moves and once-in-a-lifetime memories. You care about your memories, about capturing the authentic and JOYFUL moments of your day, and you truly value having photos that will look as great on your wall as they will on the pages of a bridal magazine. 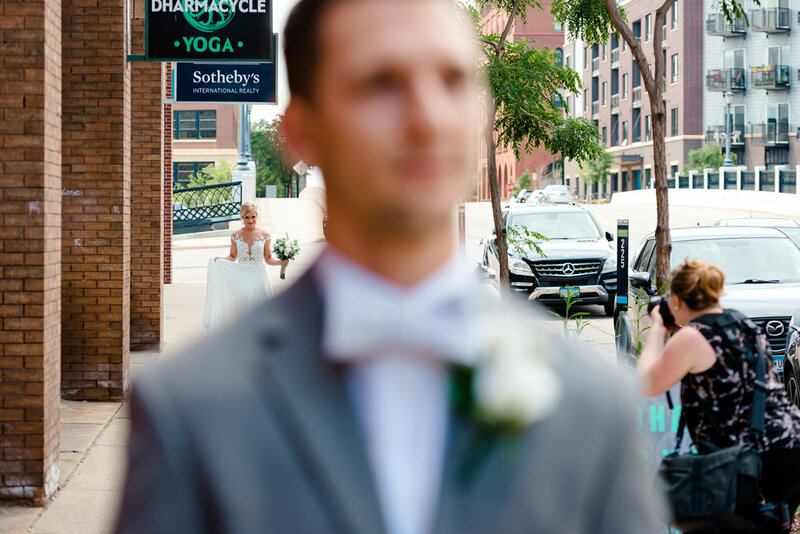 HAVING ZERO REGRETS ABOUT YOUR WEDDING PHOTOs = PRICELESS. You’ve seen a few amazing images — but what does a wedding day really look like as photographed by us? Check out some of our favorite recent weddings below! We're based in the Minneapolis area and will happily travel anywhere that you plan to celebrate your big day! We know how much work it can be to plan a wedding, so sit back, relax, and let us make you look and feel even more amazing than you thought possible. Also, hugs + dance moves come standard with any collection. Life is short. Let’s party! We believe that natural, REAL moments with REAL emotions are the moments that matter the most. That’s how we want to capture you. A large majority of our coverage is candid and documentary in style; rest assured, we will still capture beautiful, magazine-worthy images of your details and gorgeous portraits of you two and your wedding party, family and guests! With nearly 200 weddings over the last 8 years, we’ve become experts in our craft. We've been on both sides of the lens (married May 2015!) and know exactly what it is like to plan a wedding... we've been there! We’re here to help you with vendor referrals, timeline planning, you name it! We’ve even helped brides literally decide on THE dress or which bridesmaid palette would suit skin tones the best. Ain’t no shame in our (experienced!) wedding game! Not to mention, we share that awesome married-couple-mind-reading superpowers…. which means even better photos for you! The decision to hire Laura + Nathan as our photographers was THE best decision we made for our wedding. They helped us create picture perfect moments that we will treasure forever. They made taking photos enjoyable and made our day more special than we could have ever imagined. Our photography style is a mix of photojournalism/documentary-style coverage, modern wedding photography, editorial detail photography, creative portraiture, landscape photography and more. As wedding photographers, we are prepared for any situation and are experts in numerous photography specialities. Our signature editing style is crisp, vibrant and clean... a more timeless style. No funky Instagram filters here... just beautiful, timeless images. Photojournalism/Documentary Coverage (60-70%) || This is a major component of our coverage, where we are documenting your day as it unfolds, everything from how your mom looks at you as you put on your gown, to the way that your groom squints his eyes when he laughs hysterically at his best man's speech. This is "moments-based" coverage and is truly precious to our clients! Editorial / Details (10%) || Documenting everything from your dress, shoes, bouquets, antique heirlooms shared with you, your invitation suite, your perfume, the setup of your ceremony... all of these little details that you've spent COUNTLESS hours pondering will all be documented as well! Creative Portraits (10-20%) || Creative portraits are ALWAYS our clients "frame-worthy" images that end up on their walls after the wedding day! That gorgeous image at sunset, or that really cool silhouette of you on a hilltop. Even just romantic, swoon-worthy Harlequin-style smooches that belong on a romance novel! Our clients especially love these images at sunset. Lightly Posed Formal Portraits (10%) || Making sure you have beautiful, well-lit photos of you and your family, of you and grandma, of you and your flower girl... these are SO important. We always make the time to document your family legacy. These lightly posed images are often some of the most cherished after a wedding day! Our clients recognize and respect our process to carve out time for these timeless photos of their families. ............. Because this isn't about the photos, it is about the experience and the incredible journey you're about to embark on, together. And we are so honored that you want us to be by your side! Our goal is to make this experience fun, stress-free and easy for you, from the moment you say hello all the way through the engagement and wedding photos, until your heirloom album rests in your hands, ready to be loved and shared for generations to come. If you want your experience to be like that, let's chat! Laura has such an eye for creative and stunning photos. I can’t tell you how many times people have told me how gorgeous my wedding photos turned out! After spending so much time and energy planning so many little details that go into a wedding, I love being able to look back on the photos from the day to relive it all over again. your once-in-a-lifetime day deserves once-in-a-lifetime photos. Private champagne party in our studio! If you want an all-inclusive wedding photography experience, you’re in the right place! YES, I WANT AWESOME PHOTOS! Getting married in Minnesota or Western Wisconsin? Be sure to check out Our Minnesota Wedding Venue Bucket List. If you're getting married at any of these venues, we have a special promotion for you! or looking for a last-minute (AWESOME) wedding photographer? We offer special packages for our couples planning intimate celebrations + destination weddings! if you’ve made it this far, chances are pretty good that we belong together. Like macaroni and cheese. Or wine and cheese. Or burgers and cheese. Get in touch and say hello! Tell us a bit about you two, your wedding vision, and what you're looking for in your wedding photographer. What makes your wedding vision unique? Any epic hidden talents we should know about? Just have questions? Drop us a line! Let's set up a quick call or video chat (our fave!) to make sure we’re on the same page. We can also meet at our studio in Delano to get to know each other and make sure we're a perfect fit! Fair warning, we come prepared with hugs, humor, and champagne!!! Together, we'll plan your engagement session and wedding day coverage, create your timeline, and we'll share our best tips and vendor referrals to make sure you have the BEST DAY EVER! Get married! See your photo slideshow + drink champagne! Celebrate your love and obsess over your photos forever! We will custom design beautiful, archival quality albums and wall art for you. Your legacy will preserved beautifully and on display for generations to come. Are you the next LRP couple? You deserve the absolute best. That's why we want to make sure we are the right choice for you. So let’s chat! We take on a limited number of weddings per year to ensure our clients receive our wholehearted attention and best work. It is also truly important that we work with the right couples, and that we are a great fit for each other. We'd love to hear more about you two and what makes your love story unique and awesome!